It was a happy day at the Polish Groupie house, for about 15 minutes. Then, it became a dark day indeed. Waiting for me in the mailbox was a happy little parcel from Enchanted Polish, containing the three completely awesome holo polishes I snagged during Chelsea’s last restock on Etsy. 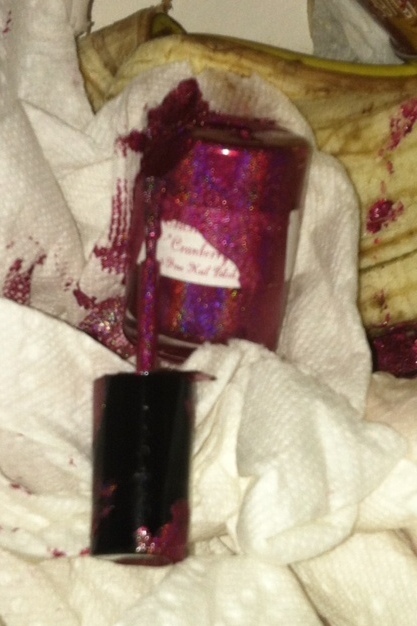 I got Lucy In the Sky With Diamonds, Magic Mirror and Cranberry Cosmo (the one that was an early front runner for new favorite bestest-ever color). Then came the error in judgement that will haunt me until I somehow manage to procure another bottle: I let The Toddler play with the bottles, and before I even knew what happened he had somehow managed to break the bottle of Cranberry Cosmo. Luckily he was not injured, so that’s the main thing. But the polish spilled all over my hardwood floor (and onto his little fingers and toes, so he managed to track a bit of it from living room into the kitchen and even smear it on some cabinets before I could get everything cleaned up). Thank goodness my mother is visiting or I would never have been able to manage. As it was, I soaked up as much as I could with paper towels while she cleaned him up, and then I had to make a trip to buy some non-acetone polish remover to use on the floors (acetone would have eaten away the finish). So I lost the bottle and had a craptastic time cleaning up as well. Dark day indeed. 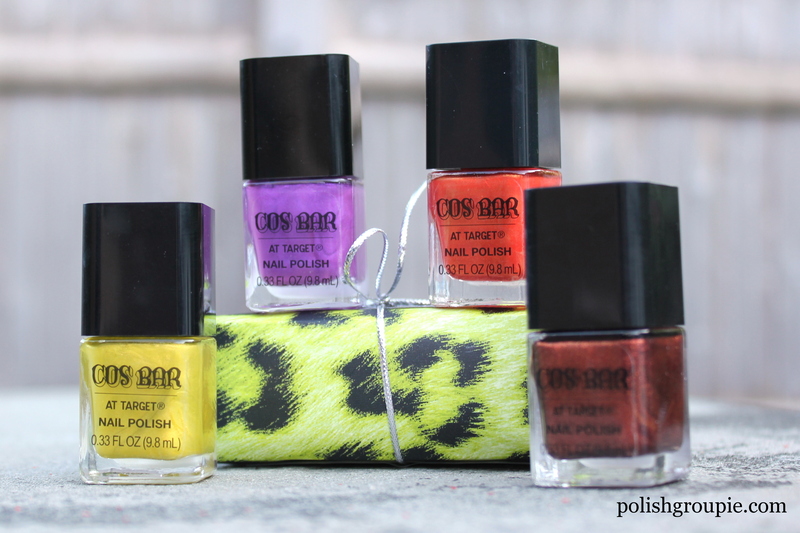 If you haven’t checked out the new ‘Shops at Target’ thing that Target has going on right now, it might be worth your while just to pick up some of the nail polishes there from Cos Bar, a high-end cosmetics store in Aspen. I grabbed all four of the colors they were offering, which were $3 each for a 0.33 FL OZ/9.8 mL bottle. The bottles themselves don’t have names on them, but they do have names in their listings on target.com: Lime Green, Purple, Copper.and Bronze (l to r). I also picked up a bar of cucumber melon soap from the Cos Bar collection, which is included in the photo just because of its snazzy wrapper. Will use them in some nail art soon; They all look very shimmery, and I’m thinking they might make for a wicked water marble.